California is looking to extend a perk for electric car owners, the ability to drive solo in the HOV lane, until 2025, according to a bill introduced recently in the California Assembly. The perk, thought to be a big selling point in electric car adoption, is otherwise going to expire in 2015. A similar perk for hybrid car owners, that expired in 2011, is thought to have played a big role in popularizing hybrid cars 10 years ago. California currently offers this perk for three sorts of cars: all electric cars, CNG cars, and plug-in hybrid cars. It is enforced by stickers you affix to the side of the car. 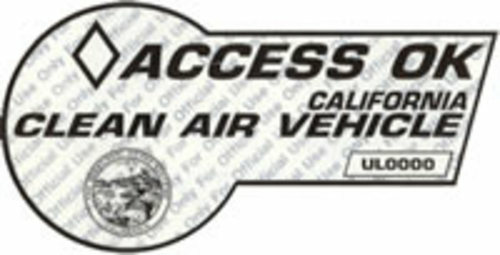 California State Assembly Member Blumenfield introduced AB266 to, among other things, extend the HOV sticker for these cars until Jan 1, 2025. The program will remain as it is today, Blumenfield's bill simply extends the date until 2025. Qualifying vehicles must meet one of several low emissions standards, including: California’s super ultra-low emission vehicle (SULEV), the Federal inherently low-emission vehicle (ILEV) evaporative emission standard, or California’s advanced technology partial zero-emission vehicle (AT PZEV). The program someone who is driving solo, while driving a qualifying car that has the HOV access sticker, to legally drive solo in the HOV lane. It is a highly prized privilege for some because it speeds up commuting time. The HOV program originally served two purposes: Reducing traffic congestion by reducing the number of cars with solo drivers, Reducing air pollution by reducing the number of cars on the road. The reasoning behind allowing clean vehicle drivers to drive solo in the HOV lane is that it serves the air pollution reduction goal of the HOV lanes. The white HOV sticker is available for the all electric cars (Nissan Leaf, et al), fuel cell cars, and CNG cars. The green HOV sticker is available for the plug-in hybrid cars (Chevy Volt, Toyota Prius Plug-in, et al). The gold HOV sticker for the early hybrid cars is no longer available, and no longer valid.